"Dear Norman: Imagine my joy when unwrapping my Christmas present I should discover the handsome Duke Bamboo. When trying it out for the first time, it slides easily across the page and has a fine, consistent line. I particularly like the converter with its tiny metal device that keeps the ink from sticking to the converter sides. And the converter is so easy to work. 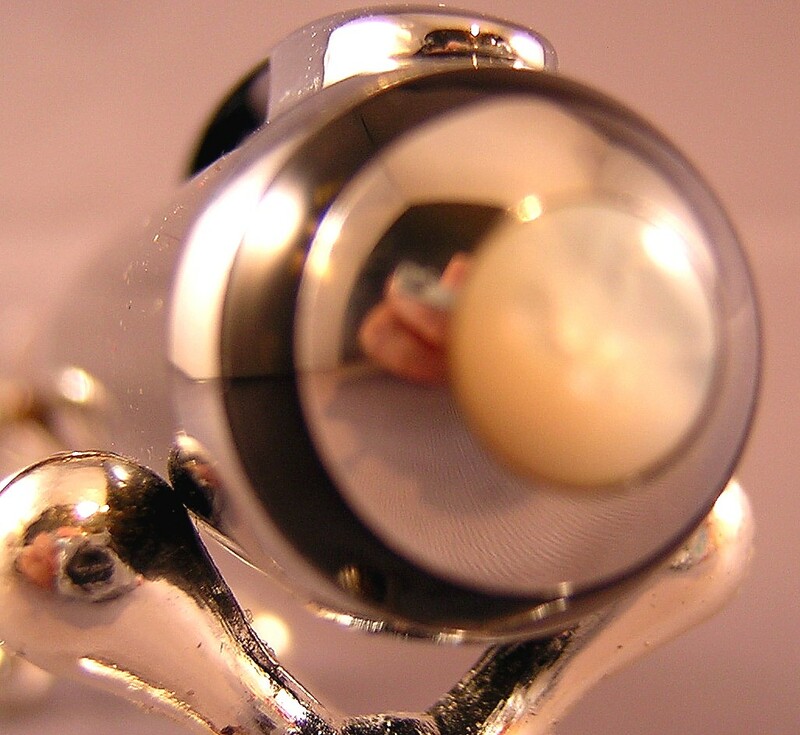 It is an amazing pen for the price." 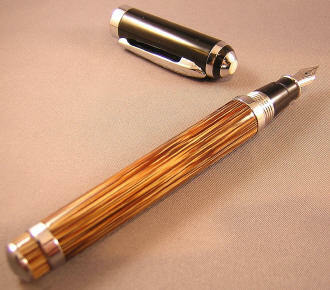 "Dear Norman, The Duke Bamboo fp arrived today, and I appreciate your sending it so promptly. 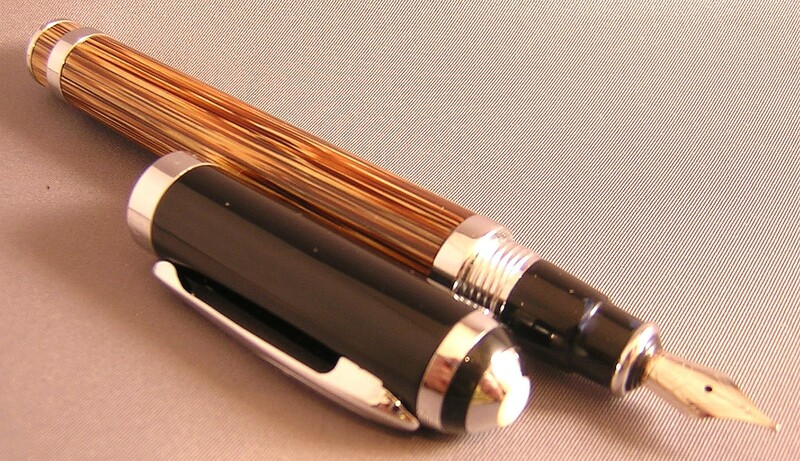 The pen is very attractive, well-made, and comfortable to use. The ink flow is just as I like it, and I appreciate very much your making the flow adjustments I requested. What continues to amaze me is that a pen of this quality can be offered at such a low price whereas other pens costing much more offer much less. In many instances, I guess, it is the name one pays for, but that means nothing to me if the pen doesn’t write well or is cheaply made. Your enclosed note meant even more this time because of your video showing the process you use to form them. They are a wonderful addition to your excellent service, and I save them all." "Hi Norman. The Bamboo arrived safe and sound and it is a lovely pen! It writes so smoothly and I love the heft of it!... It is a smooth writing pen and makes writing a breeze! Cheers." "Hello Norman. A BIG thank you is in order for the two outstanding pens. This is the Duke Bamboo [handwritten note] inked with Eclat de Saphir. Lovely -- smooth and wet! The Baoer 8-Horse is just as nice. Both magnificent in their own right. Your promptness in processing my order is very much appreciated as well. I wish you continued success. P. S. The included note was over the top!" "Dear Norman, I've been meaning to write to you for sometime about the Duke Bamboo which I bought from you a couple of months ago. What can I say? From the moment I started writing with it, I was completely in love with it. I could spend many absent minutes in between studying gazing at the grain of the bamboo and the way it caught the light. It served me immensely well in sitting my final undergraduate exams, and the esteem in which I held it could explain the only moment of mild consternation which I experienced on my wedding day last week - when I realised that it had somehow ended up, after I used it to sign the register, being nominated as the pen for guests to write in the guest-book with! As apparently one guest asked 'which way up do you hold it?' (wince! ), it can only be a testament to the sturdy nature of the nib that it was still as beautifully smooth the day after as it had been before. Unfortunately, you may have noticed that I write in the past tense. A couple of days ago, tragedy struck - I had packed the Bamboo in my rucksack for a journey and, somewhere along the line, it must have managed to slip out. To say that I acted like a bear with a sore head when I realised its absence would be putting it mildly! Indeed, I fear I scowl every time that I am forced to write something down in the spare gel pen which I brought - the resistance, the plasticky look of the ink! I have been spoilt by wonderful fountain pens. I am hoping the Bamboo might be found through some judicious calling of bus companies, but, if it cannot, could you please (once again!) put me on the waiting list for another should you get another batch in? I have been saving up for a new laptop with which to commence graduate studies, but have decided that equally important is a good pen -- so I am going to get a cheaper laptop, and another Bamboo, and will then surely be well and truly set-up for another couple of degrees!" "Hi Norman, the pen and pen roll arrived today. Thanks to your instructions on initial clean, the Bamboo is writing beautifully from the get-go. The pen roll [Tracery Vines] is absolutely lovely. The note with the wax seal is a lovely touch. Thank you so much for the service and I hope to shop again soon!" "The Bamboo pen just arrived. I'm afraid my English is not good enough to describe how pleased I feel. From the gorgeous case to the clean writing: the pen itself is so beautiful, the feel in my hand while writing is that of something strong and delicate at the same time...Wonderful. Thank you." "By the way, the last two pens [he purchased a Duke Bamboo and Haolilai ZHF-101] were real beauties. I wasn't surprised, however, I have yet to be less than thrilled with your merchandise. This is unusual in this day in age, where disappointment is the norm." "The Duke Bamboo pen arrived today. I've been using it for the last few hours, and I'm very pleased with it. It's as handsome a pen as I expected from the pictures on your website, but I was pleasantly surprised by the quality of the nib as well. It writes very smoothly, even on lower quality paper (I tend to write in cheap composition books, which are hit or miss for fountain pens). Also--and I don't know whether this is a result of the nib's engineering, your adjustments, or both--it is one of only two pens I have used whose nibs do not creep when filled with my preferred Noodler's Inks (the other being a much pricier Sailor)." "First of all, thank you very much for the Duke Bamboo pen that I ordered from you recently...I would like to say more fully that the pen is beautiful, exceptionally well made, and writes superbly (which I attribute in no small measure to your checking of each and every nib, especially going by my past experiences with nibs out of the box on far more expensive pens); and the whole buying experience is made a pleasure by your first class service and attention to detail." "Hi Norman. The pen (Duke, bamboo) and pen-roll arrived! I'm still getting used to the feel of it--alas, the way I prefer to grip pens happens to span this pen's metal threaded join between section and barrel, due to the shorter section on this pen--but I can't believe how well it writes! Thanks for the tuning, you got the balance just right, not too dry, not too wet. It writes so "smoothly"... not butter smooth, but a more "utilitarian smooth", that's the best way I can put it. Reminds me a lot of the feel of the LAMY Safari in fact. I doubt the the professed German roots of the Duke are reason, but who knows. The smoothness is so at odds with nib's rather very common and basic appearance. Anyhow, thanks for a great pen, it's vying for top spot of "daily pen" with my Safari now. :-) BTW, I really liked the packaging (and the seal!)." "Norman, Received my latest order this afternoon. Really appreciate your service in what must be trying times. Those series 329 pens took me back to my youth. They are smooth. Remind me so much of the feel of the Parker 61 although the barrel appears to be slightly smaller. I believe the Copper Burst does work better for my vision. Stands out more than the Chocolat for my reading. As usual, saving the best for last. Thanks for the selection on the Duke Bamboo. This pen in six hours has become one of my all-time favorites. To put it mildly, this is a luxury pen at a student price. The pen maneuvers with such balance that it's hard to believe the length is so great. 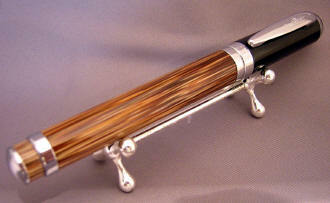 Only comparable length I have tried is a Mount Blanc Diplomat and the Duke has it beat on balance. The dark bamboo brings back memories of a lamented lost Pelikan 800. That delicate taper makes you take a second look. And then I started to write with it. It more than matches the two pens I referred to above. Really satisfying...This Bamboo pen is so smooth...Thanks again." "Norman, the pens arrived and are wonderful. The Duke is a Gorgeous pen and an incredibly smooth writer (given your adjustments), the ink flow is perfect for me! The Pilot is an incredible value, the stub nib writes wonderfully and it seems to be a great value in an everyday writer. I believe I remember that it comes in a BB nib as well, if so I will be ordering one. I love stub nibs and the nib is what makes that pen a great piece. Thanks for your prompt service. Till next time...."
"Hi Norman, I wanted you to know that I really like the Duke. I used it today at a conference, and besides its great looks it is a very good writer. The nib reminds me of those on Cross FPs (which, to me, are very good). Thanks again Norman--you have a winner here! This is, by far, the best Duke pen that I have tried." The most versatile grass plant in the world -- and certainly the Panda Bear's favorite -- finds its way into making the barrel of the gorgeous DUKE Bamboo fountain pen. This is a full-sized model, measuring 5-3/4" capped, 5" with cap aside, and a humungous 7" with its cap posted. The pen is light enough that posting the cap is not unreasonable, but certainly not necessary for a comfortable fit in the hand. These pens were on my order waiting-list for several months, as my supplier told me that DUKE was out-of-stock of the special bamboo used in their manufacture. I thought that bamboo was bamboo, but have since learned that there are at least one-thousand species, and the deep, rich texture and coloration of this bamboo was definitely worth the wait. The long barrel of bamboo -- which is lacquer-coated -- is interrupted at the end by a metal posting band. Interestingly, the bamboo is continued, in a stepped-down diameter, beyond that...until it meets the dome-shaped chrome end-cap. An additional metal band balances the other end of the barrel, where it meets one of the three bands adorning the cap. All-in-all, a well thought out design. The cap top is adorned with a pearl 'jewel', and the black lacquered cap tends to accentuate the beauty of the wood barrel. Unscrewing the all-metal fittings between the cap and barrel reveals not only the silver steel nib -- which I would rate as a light-medium -- but also the two-step section. Rather than use just a plain black section, Duke used a resin with blue and white pearlized inclusions. It's a subtle, but pleasant discovery. The included piston converter, for bottled ink, has a wire agitator to help prevent ink adherence to the converter's sides...but as with all new pens, I recommend to run a dilute solution of dishwashing soap (two or three drops to a small bowl of water) through a new pen a few times, followed by water only. Step one is effective at removing manufacturing oils that can tend to make the ink less than enthusiastic in heading from the converter/filler to the nib, and step two removes the traces of the detergent you've used...which tends to have the opposite, diuretic effect. The pen comes equipped with a piston converter for bottled ink and will also fit International-style cartridges, such as those from Private Reserve. A gift box is included.